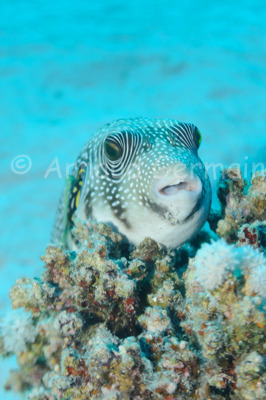 This species of puffer is fairly easy to photograph in Marsa Shagra as they are quite common and very often rest on top of a coral outcrop. If you approach carefully, you can get really close without the fish being bothered. Marsa Shagra North House Reef, about 18 metres down, Marsa Alam, Egypt.